The Montgomery County Sheriff’s Office, The Montgomery County Sheriff Citizen’s Academy Alumni Association and our many community partners are celebrating the Second Annual Community Christmas Toy Drive “Operation Blue Elf”! Last year, thanks to our wonderful citizens and community partners, over 700 children of Montgomery County had a brighter Christmas. We are again asking for your help to make Christmas better for our communities’ children in need by donating new, unwrapped toys at one of our many drop off locations throughout Montgomery County. 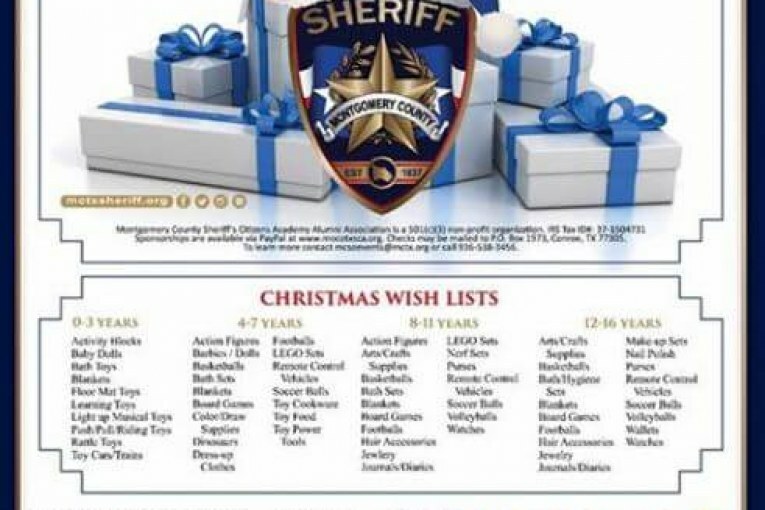 Our community partners are working to identify children, infants to early teenagers, which are in need of Santa and his Blue Elf helpers this year. Kindness and generosity have always been hallmarks of the Texas Spirit, and no place does it better than Montgomery County. Let’s continue to show the rest of Texas how truly passionate and caring Montgomery County is. Santa and his Blue Elves need your help! Thank you for your continued support, kindness, and holiday spirit! 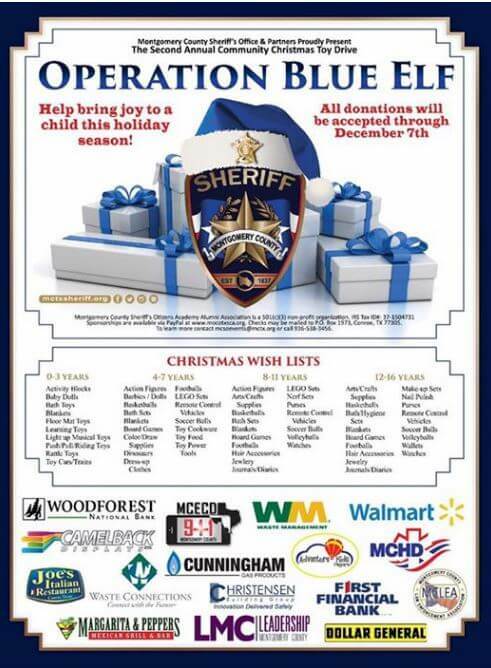 Thank you to our partners who have again stepped up to the sleigh to make this possible. 602 Honea Egypt Rd. Magnolia, Tx. 2495 N Loop 336W Conroe, Tx. 11092 Browder Traylor Conroe, Tx. 4203 West Davis Conroe, Tx. 2455 Lake Robbins Spring, Tx. 11219 Little Egypt Rd. Conroe, Tx. 6437 Hwy 105 W Conroe, Tx. The Blair Law Firm, P. C.